A new client recently asked me about the sustainability of upwardly moving prices in Boulder. He was specifically interested in the Devil's Thumb neighborhood. 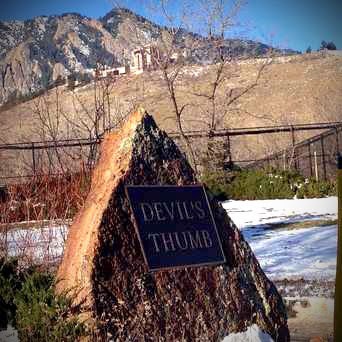 Devil's Thumb is an attractive neighborhood in Boulder but do the fundamental economics of supply and demand support continued price appreciation? Given my investment analysis background, I'm probably more qualified than most Realtors to answer. If you're a regular blog reader, you know what happened next. I'm not about to answer by the seat of my pants. Although I've done several transactions in Devil's Thumb (two last year alone), and many more in Table Mesa, I dug into the data before writing a response. This particular buyer is early stage and wisely shopping Realtors. I strongly support that process. If you're a buyer, it's smarter to shop Realtors than shop for a specific house. While he makes a decision, I'm going to share the analysis. To help answer the question, I pulled sales data for Devil's Thumb going as far back as 1997. Take a look at the following charts. The yellow bars in the chart above represent the volume of houses sold in the Devil's Thumb neighborhood. The blue line is the average negotiated discount from asking. - First, Devil's Thumb is a low volume neighborhood. The highest volume year was 1999 when seventeen homes sold. Last year, there were only ten. Note that between the years 2000 and 2007, the neighborhood typically only saw eight to ten sales per year. The inventory shortage doesn't seem to be impacting the number of transactions in Devil's Thumb. - The average negotiated discount fell to near zero during strong seller's markets, most notably 2000 and 2006. Both of these years were at or near the cyclical peak of the real estate cycle. Last year's average discount was a little over 1%. - The most recent downturn produced average negotiated discounts from 4.5% to nearly 7% (from asking). This was far higher than the past. This next chart (above) shows median and average sold price. I'm including both because with such low volume, the average can easily skew higher or lower. The change in median is a little more reliable but both pieces of information are useful. - Prices continued to climb for one year past the peak of the real estate cycles in 2000 and 2006. This is what I consider market momentum. It's also evidence that a lot of buyers simply aren't getting good market information from their Realtors. They should have hired a better one. - Prices recovered relatively quickly after the downturn. There was no bubble market bust where prices fell 40-50% in Devil's Thumb. - Everyone wishes they bought a house 1997. I wish I bought several. This last chart shows the distribution of sold prices over time in Devil's Thumb. I added the blue line to emphasize the psychological $1MM threshold. In the version I sent to my client, I included a third order polynomial regression to show a trendline but the R-squared wasn't great, so I removed it. - The gap between the lowest and highest price home sales in Devil's Thumb is widening. My theory? It's caused by the increasing premium buyers are willing to pay for homes that are built around open space views. These ultra premium luxury homes appear to be appreciating at a faster rate than mere ordinary homes. This phenomenon, by the way, is inline with an analysis I did a few years ago on ultraluxury property on the island of Nantucket which showed waterfront homes exhibited the same pattern. If you can swing it, buy unobstructed open space views. They are the equivalent of waterfront in Boulder. - Prices seem to have flattened somewhat beginning in 2007, about a year after the peak of the last real estate cycle. The exception is for the highest value homes which continued to accelerate upward. Note, I see a trend but the sample size is so low that it's likely not statistically significant. The ghost of my old b-school statistics professor insisted I write the preceding sentence. My last clients who bought in Devil's Thumb are very satisfied. To help them feel confident about valuation and their decision, we spent a lot of time evaluating alternative neighborhoods. The conclusion we reached was that Devil's Thumb simply doesn't have as many high end homes as N. Boulder (less depth of market) and thus availability is even more limited than in neighborhoods like Newlands. This can have both positive and negative consequences for eventual resale. It can also exacerbate the low appraisal problem. See Low Appraisals, What Your Agent Isn't Telling You for more reading. I hope you've enjoyed this analysis. If you'd like to view property in Devil's Thumb with me as your buyer's agent or are considering selling your property, contact me. My goal is to add value and help you make a smarter real estate decision. ph: 303.746.6896.